Since fighting broke out in the volatile Sudanese state of South Kordofan on June 5, accounts trickling out from the largely sealed-off war zone have attested to the Sudanese army, or SAF, and other affiliated government forces killing and committing other acts of violence against its civilians. Information out of the area continues to remain scarce and difficult to confirm. In the most comprehensive cataloguing of gross human rights violations committed in the conflict so far, a June UNMIS human rights report seen by Enough provides gruesome details of brazen executions of civilians, intimidation and assault of U.N. personnel, and forced returns and displacement of populations, all acts that may constitute war crimes and crimes against humanity. On 8 June, a man was shot several times and killed in full public view at the Kadugli Police Hospital. He had gone to the hospital in an attempt to try to find his three missing children whom he believed were inside the premises. The victim was an active SPLM member and sat on the SPLM elections committee. According to eye witnesses, two other persons were also shot and killed in front of the Police Hospital in a similar manner. A young woman of Nuban descent informed UNMIS Human Rights that she was arrested in the vicinity of the Kadugli Police Headquarters on 20 June. During her detention she was interrogated about her work with an international NGO and accused of being a SPLM supporter while police beat her with fists, sticks, rubber hoses and electric wires. UNMIS Human Rights noted the bruises and scars on the woman’s neck and back consistent with her statements. On 8 June, UNMIS Human Rights witnessed the movement of four armed men (two armed civilians and two Central Reserve Police) carrying weapons in and out of the UNMIS Protective Perimeter without any intervention from the UNMIS peacekeepers guarding the premises. The armed men conducted identity checks on the IDPs. Eyewitnesses interviewed reported that the armed men abducted three IDPs from the vicinity of the UNMIS Protective Perimeter on suspicion that they were supporters of the SPLM. On 8 June, an UNMIS independent contractor (IC) was pulled out of a vehicle by SAF in front of the UNMIS Kadugli Sector IV Compound in the presence of several witnesses, while UN peacekeepers could not intervene. He was taken around the corner of the compound and gunshots were heard. Later he was discovered dead by UNMIS personnel and IDPs. Several sources confirmed that the victim was an active SPLM member. On 7 June, an UNMIS truck was stopped at a checkpoint near the UNMIS Sector IV compound. Three of the ten IDPs who had been assisting UNMIS personnel with loading supplies for IDPs were pulled out of the truck and beaten up by SAF personnel. An UNMIS staff member who attempted to intervene was threatened at gunpoint by one of the soldiers who asked him “do you want to stay or leave”. The UN personnel drove off with the seven remaining IDPs. The fate of the three IDPs remains unknown. A SAF Captain instructed the UNMOs to line up and be killed. He removed the safety of his AK-47, and just as he was about to point the weapon towards the UNMOs, a SAF Major entered the room and ordered him not to shoot. Immediately following the intervention the officer with the gun shouted “UNMIS leave Southern Kordofan, if not we will kill you if you come back here.” The team was released and told not to return back to Kadugli town. 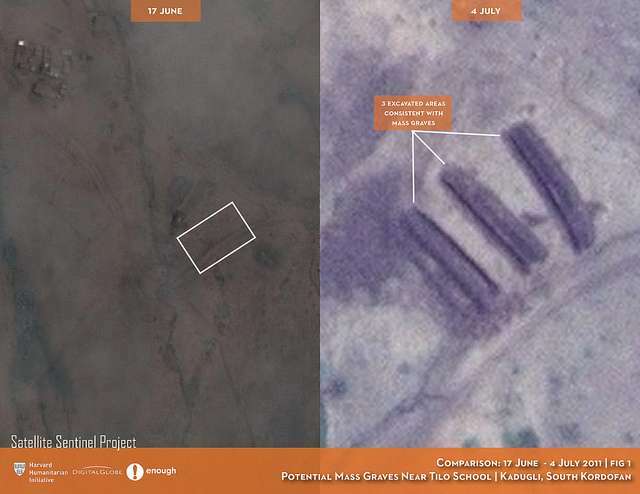 Just today, the Satellite Sentinel Project provided the first images of what appear to be mass graves and body bags. An independent and comprehensive investigation into the violations in South Kordofan that brings to account those most responsible is a key recommendation of the report. Although both parties to the conflict have engaged in acts against civilians throughout the course of the recent conflict in Southern Kordofan (…) it is the conduct of the SAF [that] has been especially egregious. Instead of distinguishing between civilians and combatants and accordingly directly their military operations only against military targets, the SAF and allied paramilitary forces have targeted members and supporters of the SPLM/A, most of whom are Nubans and other dark skinned people. The International Community cannot afford to remain silent in the face of such deliberate attacks by the Government of Sudan against its own people. If the current conduct of the SAF, especially the aerial bombardments, does not stop, it will dissipate the Nuban population in Southern Kordofan.